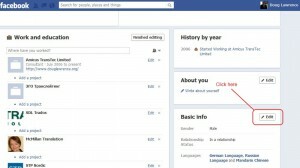 Read Facebook Help Centre How do I display an alternate name (ex: nickname or maiden name) on my profile? (to add a name in another character set in brackets after your Facebook name), and/or the Help Centre Language-specific names article. ‘Alternative name’, which isn’t searchable but appears in brackets after your name so looks ‘cool’ or ‘pretentious’ depending on your point-of-view. The screen shots below were taken by me as I added my name in Russian (Russian Cyrillic) and Chinese (traditional Chinese characters) at the end June 2012. 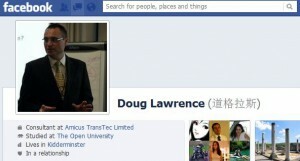 I use Facebook as an ‘English (UK)’ language user. Facebook was accessed whilst I was in Madrid – what I’m trying to say is that different language variants of Facebook may behave differently, or as my US friends say “your mileage may vary”. I’m not sure if you need to tell Facebook you can speak a language before you use it in ‘Alternative name’ field, but assuming you want to use a non-Latin equivalent then I had problems adding a nickname for a language I hadn’t told Facebook I could speak. When I tried to add my Korean name in Hangeul Facebook say there were too many characters. So to avoid any problems I recommend you add the languages you want your name in as languages you can speak first. 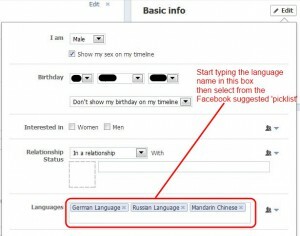 Step 3: Next start typing in the language you want to say you know in the ‘language box’. Facebook will auto-suggest so choose the language you think is right – this didn’t feel right to me as it looked like I was selecting ‘pages’ about the languages but it worked nevertheless. 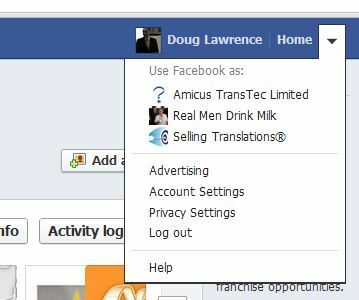 Step 4: Now you’ve told Facebook which language(s) you ‘know’, you can save your changes and select ‘Account Settings’ from the drop down menu next to ‘Home’. 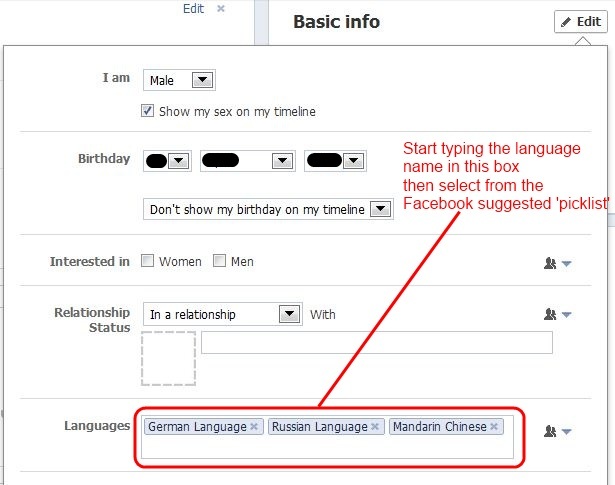 Step 6: Type your name(s) into the appropriate box(es) – because I told Facebook I ‘know’ Russian, Chinese and German I have boxes for Russian and Chinese. Step 7a: Add your password and click ‘Save changes’, if everything is OK you will be returned to the ‘General settings’ page. 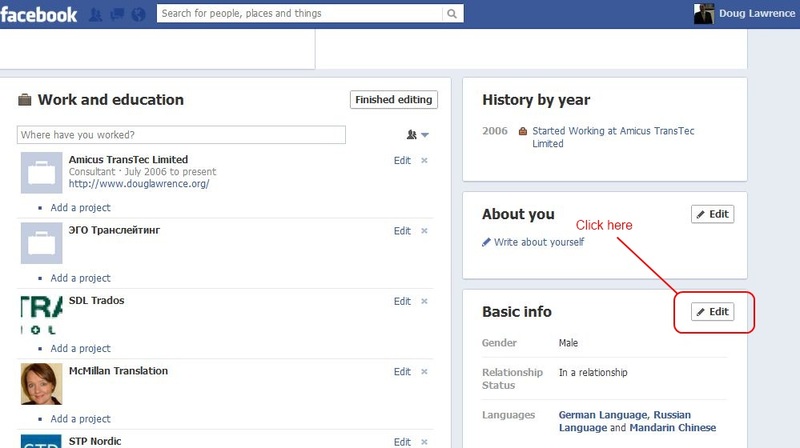 Step 7b: Type in your new ‘language-specific name in the Facebook search box, if your update worked then your profile should be shown in the search drop-down suggestions list. The image below shows that my Russian name was added successfully. Step 8: Adding an ‘Alternative name’, this is pretty straight forward at this stage you can just type in your ‘alternate name’ in appropriate box. 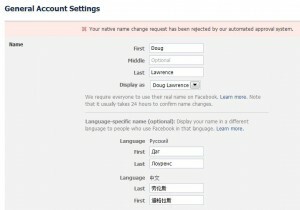 I was only able to type my Chinese ‘first’ name not my ‘surname’. 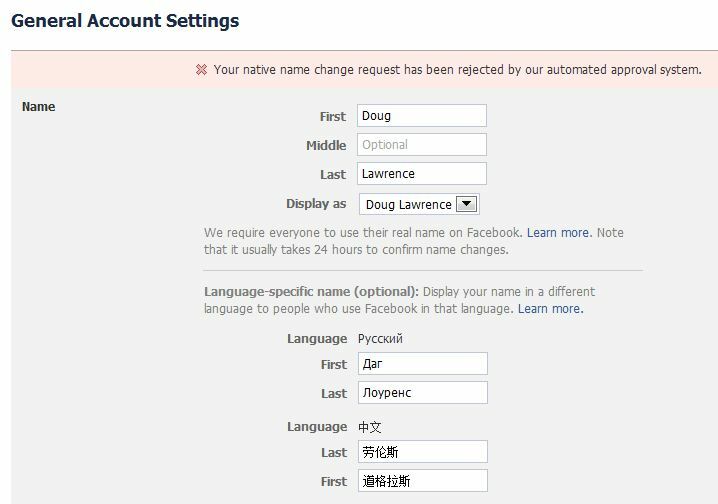 Facebook would not allow me to add my full Chinese name (which was typed, checked and confirmed as correct by a native Chinese speaker). Having tried various combinations I decided to add my Chinese name as an ‘alternative name’, however I was unable to add my both first name and surname. That’s all folks! If you’ve got this far you should now have the multilingual names wanted! 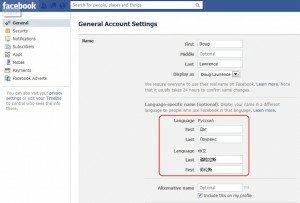 I just want to be able to tag my Russian friends, with Cyrillic Facebook names, in my Facebook posts. Say, I’m writing a post on FB, and I want to mention 5 friends such that they will each be Notified because I’ve formally “tagged” their FB name within my post text . 4 of them are fellow Americans with easily tunable names like “Bob”. Easy. But the fifth has a name beginning with an obscure (to me) Cyrillic alphabetic character. What do ??? I’ve listed in my account that I speak greek, english, french and russian language but trying to change my language-specific name the only options I have is to change it in greek and russian. Why is that? I think there might be a 2 language limit in Facebook.